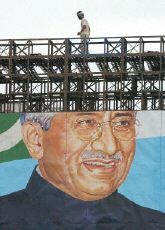 A worker repairs a giant portrait of Pakistani President Gen. Pervez Musharraf in Islamabad, May 1, 2002 (Photo: AFP). Eight months ago, Pakistan’s self-declared president, Gen. Pervez Musharraf, was an international pariah. Two years after he had ousted the prime minister in a coup, The Economist summed up world opinion of him with damning brevity: “a useless dictator.” That, of course, was before Sept. 11. Much has changed since then and, in his new role as a key ally in the war against terrorism, the general has shown a shrewd appreciation of how to preserve newfound respectability. He has professed a commitment to restoring democracy, and yet he orchestrated this week’s referendum, which remains constitutionally dubious. Although general elections are promised in October, the constraints to be imposed on the victors make it clear that the general will retain ultimate power. That is not to say that his declared goals are not desirable; indeed, he is most strongly opposed by the old, corrupt elites and religious fundamentalists. But recently acquired sympathizers in the West have succumbed to the old delusions that propped up many an anti-communist dictator: Democratic goals can be achieved by undemocratic means, and strong men rather than strong institutions offer stability. For instance, Musharraf has begun to rein in religious extremists, but for his power he relies on the very army whose Islamist-influenced philosophies have long subverted the institutions of state. Extremism can be best delegitimized by elections, and in Pakistan the religious parties’ vote historically has fallen short of 5 percent. He also promises to eliminate corruption, while corruption flourishes behind the closed doors of an unaccountable government. Dictatorship is itself a form of corruption in which individuals usurp the role of institutions. As for the need for economic reform and stability, if such justifications sound familiar, they should: They have been provided by all the military leaders who have ruled the nation for more than half of the 55 years since independence. Pakistan has taken many wrong turns in the past half-century, and democratic institutions and instincts have never been given time to take root. Western allies, however, have no excuse for indulging a dictator who claims to be building a democratic state. Musharraf is a man of Pakistan’s past. The future belongs to democrats who can foster, rather than enforce, the shared values that underpin a stable democracy. Musharraf may no longer be seen as useless, but he is still a dictator.